FAA’s ATADS data shows Peak Year was 1995. Total airport operations in 2014 were DOWN 22% from the peak year. The San Diego International Airport, also known as Lindbergh Field, is an airport rich in both aviation history and aviation impact. The first scheduled passenger service began in 1925, when Ryan Airlines offered daily flights to Los Angeles. The Army Air Corps took over the airport in 1942 and constructed the current runway (at 8,750′, later extended to 9,400′) to handle new heavier bombers being constructed for the war effort. KSAN embraced the jet age in 1960 and the airport now has three terminals and 55 gates (including the commuter terminal). Fanned departure headings impact schools and residents on Point Loma. 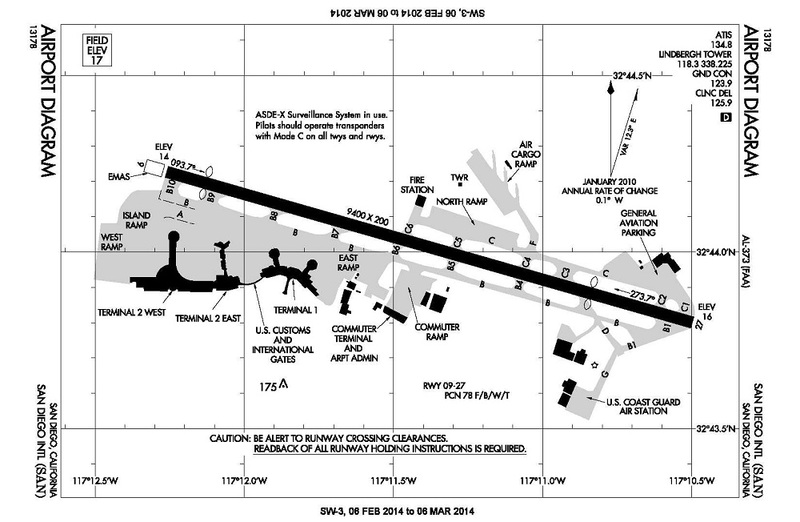 KSAN is on FAA’s OEP-35 list, as one of the key commercial airports in the nation. It is the busiest single-runway commercial airport in the U.S., and second-busiest in the world, behind London-Gatwick. The airport is also tiny at just 663-acres (which illustrates a more subtle aviation impact in that many other major airports are land-hogs, taking thousands of acres of land out of useful production). An FAA control tower provides ATC services 24/7, and handles 525 operations per day (this equates to 11 takeoffs/ATC-hr, or one takeoff every 6-minutes). Airport operations peaked in 1995; they have since declined by 24% (see data in table below). Despite that decline, well over a billion dollars of FAA AIP money has been spent adding more terminals and gates. The airport is famous among commercial pilots for an approach from the east that seemingly descends through buildings and grazes low across the I-5 freeway to land on Runway 27. On the other end of that same runway, ATC fans out strings of departures by issuing headings, especially during peak departure periods. These fanned departure headings impact the quality of life for residents of Point Loma, a place with scenery and weather that many would find to be not too far from heaven.